Eremophila debilis, Winter Apple is a ground cover with a spread of about one metre. Leaves are bright green and tend to curve upwards. They have a succulent feel. Five-petalled flowers are white, tinged with lilac and appear in spring and summer. Blooms are followed by small, fleshy fruits that turn purple when ripe and have the appearance of miniature apples, hence the common name. Growth habit, foliage and flowers are attractive features. A dense carpet could be established by planting at 1.5 metre centres. Pinch out growing tips for maximum density. 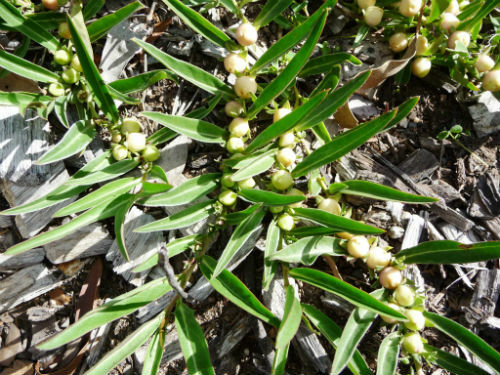 Winter Apple could also be planted with Myoporum parvifolium, another dense ground cover, to create an eye-catching, colourful, weed suppressing carpet. E. debilis was introduced to England in 1793 and New Zealand after 1830. Winter Apple was previously known as Myoporum debile. The change was made in 1992 when it was decided that that Winter Apple flowers and fruits had more in common with eremophilas than myoporums. E. debilis occurs in eastern NSW and Queensland. The species name means relaxed or week and refers to the creeping branches.